The Cathedral and The Bazaar is a classic open source story, written 20 years ago by Eric Steven Raymond. In the story, Eric describes a new revolutionary software development model where complex software projects are built without (or with a very little) central management. This new model is open source. The classic model (represented by the cathedral), in which software is crafted by a small group of individuals in a closed and controlled environment through slow and stable releases. And the new model (represented by the bazaar), in which software is crafted in an open environment where individuals can participate freely but still produce a stable and coherent system. Some of the reasons open source is so successful can be traced back to the founding principles Eric describes. Releasing early, releasing often, and accepting the fact that many heads are inevitably better than one allows open source projects to tap into the world’s pool of talent (and few companies can match that using the closed source model). Two decades after Eric's reflective analysis of the hacker community, we see open source becoming dominant. It is no longer a model only for scratching a developer’s personal itch, but instead, the place where innovation happens. Even the world's largest software companies are transitioning to this model in order to continue dominating. If we look closely at how the open source model works in practice, we realize that it is a closed system, exclusive only to open source developers and techies. The only way to influence the direction of a project is by joining the open source community, understanding the written and the unwritten rules, learning how to contribute, the coding standards, etc., and doing it yourself. This is how the bazaar works, and it is where the barter system analogy comes from. A barter system is a method of exchanging services and goods in return for other services and goods. In the bazaar—where the software is built—that means in order to take something, you must also be a producer yourself and give something back in return. And that is by exchanging your time and knowledge for getting something done. A bazaar is a place where open source developers interact with other open source developers and produce open source software the open source way. Lack of divisibility: In the absence of a common medium of exchange, a large indivisible commodity/value cannot be exchanged for a smaller commodity/value. For example, if you want to do even a small change in an open source project, you may sometimes still need to go through a high entry barrier. Storing value: If a project is important to your company, you may want to have a large investment/commitment in it. But since it is a barter system among open source developers, the only way to have a strong say is by employing many open source committers, and that is not always possible. Transferring value: If you have invested in a project (trained employees, hired open source developers) and want to move focus to another project, it is not possible to transfer expertise, reputation, and influence quickly. Temporal decoupling: The barter system does not provide a good mechanism for deferred or advance commitments. In the open source world, that means a user cannot express commitment or interest in a project in a measurable way in advance, or continuously for future periods. Below, we will explore how to address these limitations using the back door to the bazaar. People are hanging at the bazaar for different reasons: Some are there to learn, some are there to scratch a personal developer's itch, and some work for large software farms. Because the only way to have a say in the bazaar is to become part of the open source community and join the barter system, in order to gain credibility in the open source world, many large software companies employ these developers and pay them in monetary value. This represents the use of a currency system to influence the bazaar. Open source is no longer only for scratching the personal developer itch. It also accounts for a significant part of the overall software production worldwide, and there are many who want to have an influence. Open source sets the guiding principles through which developers interact and build a coherent system in a distributed way. It dictates how a project is governed, how software is built, and how the output distributed to users. It is an open consensus model for decentralized entities for building quality software together. But the open source model does not cover how open source is subsidized. Whether it is sponsored, directly or indirectly, through intrinsic or extrinsic motivators is irrelevant to the bazaar. Currently, there is no equivalent of the decentralized open source development model for subsidization purposes. 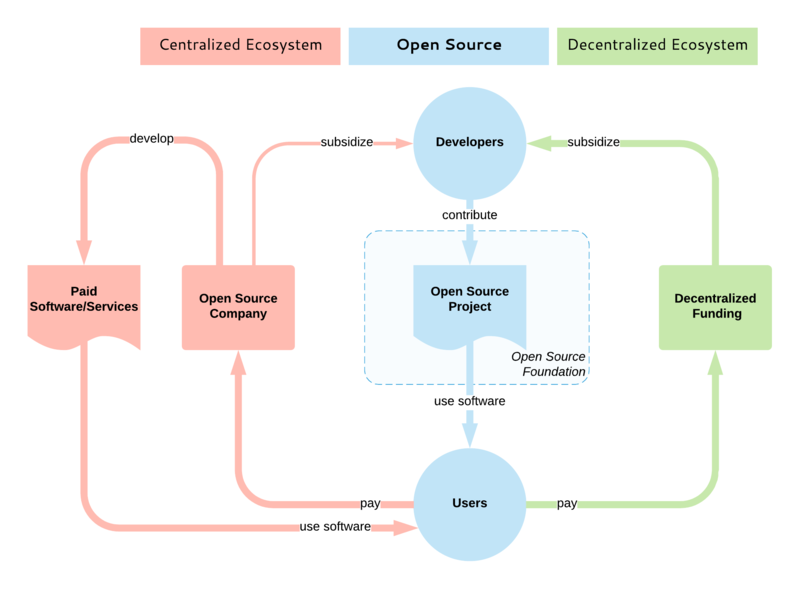 The majority of open source subsidization is centralized, where typically one company dominates a project by employing the majority of the open source developers of that project. And to be honest, this is currently the best-case scenario, as it guarantees that the developers will be paid for a long period and the project will continue to flourish. There are also exceptions for the project monopoly scenario: For example, some Cloud Native Computing Foundation projects are developed by a large number of competing companies. Also, the Apache Software Foundation aims for their projects not to be dominated by a single vendor by encouraging diverse contributors, but most of the popular projects, in reality, are still single-vendor projects. What we are missing is an open and decentralized model that works like the bazaar without a central coordination and ownership, where consumers (open source users) and producers (open source developers) interact with each other, driven by market forces and open source value. In order to complement open source, such a model must also be open and decentralized, and this is why I think the blockchain technology would fit best here. Allow divisibility: If you want something small fixed, you can pay a small amount rather than the full premium of becoming an open source developer for a project. Storing value: You can invest a large amount into a project and ensure both its continued development and that your voice is heard. Transferring value: At any point, you can stop investing in the project and move funds into other projects. Temporal decoupling: Allow regular recurring payments and subscriptions. There would be also other benefits, purely from the fact that such a blockchain-based system is transparent and decentralized: to quantify a project’s value/usefulness based on its users’ commitment, open roadmap commitment, decentralized decision making, etc. On the one hand, we see large companies hiring open source developers and acquiring open source startups and even foundational platforms (such as Microsoft buying GitHub). Many, if not most, long-running successful open source projects are centralized around a single vendor. The significance of open source and its centralization is a fact. On the other hand, the challenges around sustaining open source software are becoming more apparent, and many are investigating this space and its foundational issues more deeply. There are a few projects with high visibility and a large number of contributors, but there are also many other still-important projects that lack enough contributors and maintainers. There are many efforts trying to address the challenges of open source through blockchain. These projects should improve the transparency, decentralization, and subsidization and establish a direct link between open source users and developers. This space is still very young, but it is progressing quickly, and with time, the bazaar is going to have a cryptocurrency system. The internet is a decentralized medium that has unlocked the world’s potential for sharing and acquiring knowledge. Open source is a decentralized collaboration model that has unlocked the world’s potential for innovation. Similarly, blockchain can complement open source and become the decentralized open source subsidization model. If an organization controls 51% of the blockchain, it can rewrite it to say whatever they want. Blockchains don't work unless there are a lot of miners competing to add the next block. A discussion of blockchains without describing the incentive for miners to compete is just another centralized organization. Blockchains alone are not a magic bullet. This was a fascinating read. You made a very bold statement at the end saying the bazaar is going to have a cryptocurrency system. Where have you seen progress towards this? Do you think any will succeed over the rest? Is this something that you are working on? Speaking as a developer, it’s hard for me to trust the motivations behind any organization launching their own ICO in the name of sustaining open source. There are many efforts trying to link open source with blockchain listed previously. Not every project listed in the link is raising and ICO if that matters to you.